1. Hi Diane Rapp, tell us a bit about your latest book. Hi Rachelle! I’m so pleased you asked me to join you today. I’m here to describe Murder on a Ghost Ship. This novel is the second book in a High Seas Mystery series. The book can be read as a stand-alone story since I introduce new readers to characters introduced in the first book. I didn’t want a new reader to feel cheated. Emily Schultz calls Kayla Sanders and Natalia Baliskov to help her solve the mystery surrounding a ghost who is haunting the Sea Mist. Emily purchased the older ship for Constellation Cruise Lines at below market price and realizes why she got such a bargain. Although the “Lady” haunted one cabin on the ship for years, in recent months the ghost started causing trouble all over the ship. Kayla Sanders has a talent for solving mysteries but she doesn’t believe in ghosts. Natalia works as a mystic on stage but she has real psychic abilities. Unfortunately Natalia is afraid to make contact with the ghost. The three women must unravel the mystery of the Lady’s death to prevent another murder. More danger looms as a gang of dangerous smugglers target Kayla’s fiancé, Steven. Interpol suspended Steven after his partner got killed investigating the smuggling ring. The villains plan to kill him, putting whole ship at risk. 2. Sounds exciting. Makes me want to go right out and read it. What genres do you like to write in? Do you pay attention to genre rules or bend them? I write in two different genres, Mystery/Romance and Science/Fantasy, probably because I love to read books in both. Are there rules? Maybe I should go look them up but it doesn’t really matter. As an Indie writer I’m an expert at bending and breaking rules every day. 3. Same here. That's what being Indie is all about. :) Are you a character driven or plot driven writer? 4. Will do that! What sparked the idea for Murder on a Ghost Ship? I became addicted to the television show Ghost Whisperer. When the series ended I started wondering how I’d handle a ghost who was haunting a cruise ship. Since I planned to write a second book in the High Seas Mystery series, I incorporated the characters from the first novel into the new idea and started writing. 5. Who is your favorite character in this novel? “The Lady” was definitely the most fun to write, a mostly benevolent ghost with a temper. Murdered on the ship years ago, her spirit couldn’t “cross over.” When young lovers or honeymooners occupied “her cabin,” the Lady created a romantic atmosphere to make those passengers very happy. However, no one remained in that cabin long if she disliked them! Could you relax if the temperature dropped rapidly, invisible wet footprints crossed the carpet, and smelly seaweed dropped onto your face? She could also get very creative with the shower! When the Lady’s murderer decided to take another voyage on the Sea Mist, the Lady knew she needed to stop a second murder. No one could hear her warnings. The genuine psychic, Natalia blocked her out, so the Lady sent interesting visions to Kayla. She finally got her message across. 6. Describe a scene in your book where you would have liked to be in. Although I believe it might be scary to witness in person, I enjoyed writing the scene where the ghost got angry with paparazzi who crowded the dock in the Azores. The Lady hated sleazy reporters who made her life miserable. In this scene the Lady threw a ghostly temper tantrum, creating a mini-tornado. Remember how paparazzi hounded Princess Diana, probably causing her death? Perhaps Diana’s ghost offered me a few pointers about writing this scene. 7. Sounds like the paparazzi got what they deserved. What is your greatest fear? I’m afraid of heights, particularly winding mountain roads with steep drop offs. In nightmares my car goes over the edge of a cliff and I’m falling, falling…until I wake up. In horror movies I also fear the unseen monster or the one that people can’t escape…The Blob gave me real nightmares. Ghosts are in that last category, unseen dangers you can’t get away from…very spooky. I often ask friends this question and their answers provide new ways to plan scenes. 8. Any advice for upcoming authors? Read! When you find a novel you love, read it again and again. Dissect the scenes that really grab the reader and try to understand how the author created the magic. There are many different ways to achieve results, so study your craft. I keep a bookcase filled with old favorites that I revisit when I need inspiration…Agatha Christie, Arthur Conan Doyle, Anne McCaffrey, C.J. Cherryh, and Marion Zimmer Bradley each have large sections in my private bookcase. Don’t try to copy a writer’s style but determine elements that makes their stories come alive for you as a reader. Weave those elements into your own style. 9. What is one thing you wish you knew before you began this journey? I wish I’d paid more attention to grammar and punctuation in English classes. Most beginning writers make egregious mistakes that feel embarrassing when they finally learn their craft. When selling your product to a consumer, you may only have one chance to create a first impression. 10. Did you dream of being a writer or something else? Writing was never a dream, it was a compulsion. Stories float inside my head until I am forced to write them down. At first I wrote for myself and then I dared share my stories with others. The dream became selling my novels. I wasted years working with agents and finally signed a contract with a publisher. Before the book was printed, the publisher filed bankruptcy. I faced starting all over again and quit writing for five years. My husband and I traveled the country in an RV during those years. One day my husband read an article in an RV magazine about Indie authors who were making money publishing e-books. He gave the article to me and I got excited. Every time I deposit a royalty check I tingle with excitement! 11. What’s your next project? The third book in my High Seas Mystery series will be released in 2013. It is called Murder For Glacier Blue. The research is done, the timeline is prepared, and the characters are lined up waiting to be introduced into the manuscript. (Of course they’re already arguing with me about their roles.) The book will feature an art heist leading to a murder, a potential wedding in Glacier Bay National Park, a bunch of crazy golfers who want to play golf at midnight, and Steven’s ex-wife shows up to cause trouble for Kayla! Things are progressing nicely. The fun part of being an author is traveling to exciting places for research. Last August my husband and I took a two-week cruise along the coastline of Alaska. We absorbed the atmosphere, clicked photos of astonishing glaciers and remarkable wild animals, and we met plenty of unique characters. I hope readers will enjoy Murder on a Ghost Ship and get ready to join Kayla and Steven as guests to their wedding in Alaska. Diane Rapp became an entrepreneur when she started her own dog grooming salon in Santa Barbara, California. She spent the next thirty years as a small business owner; she sold real estate, started an office supply store in Telluride, Colorado, and performed free-lance advertising design. During all those years Diane wrote stories as a cure for insomnia. She wrote short stories about dogs for a German Shepherd Dog Club newsletter, and then expanded to full length novels. 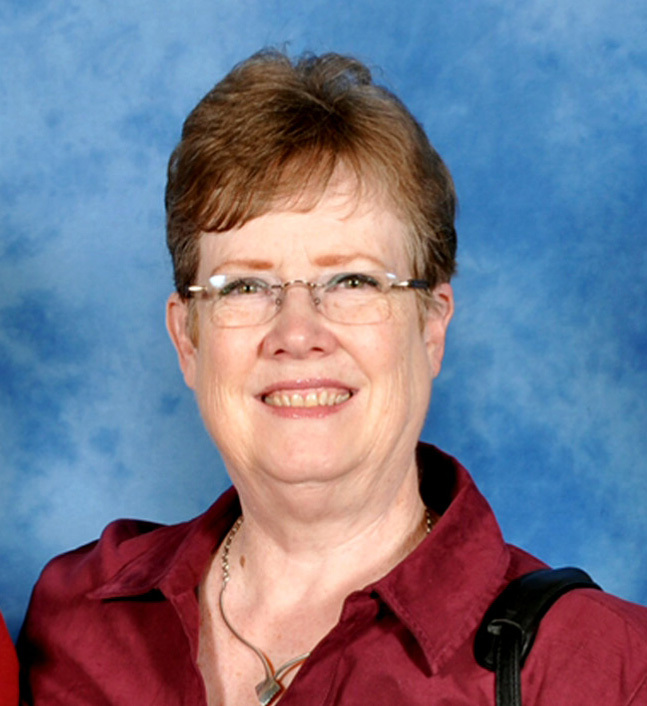 After Diane and her daughter Laura co-authored a travel guidebook entitled Cruising the Eastern Caribbean (four editions were published by Hunter Publishing), Laura gave Diane the idea of writing a mystery set on cruise ships in the Caribbean. 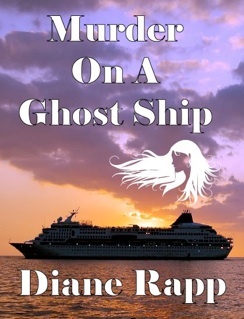 The first novel of her High Seas Mystery series was Murder Caribbean-Style, the second book in the series was Murder on a Ghost Ship. A third novel (featuring a wedding cruise to Alaska) is the planning stage. Diane’s new science fiction novel Howl of the Wolf is the first book of her Heirs to the Throne series. The setting is the planet Drako, originally colonized as a recreation planet the monarchy revolted against technology and closed the planet to offworld visitors. When fugitives from civilized space land on the planet, they encounter superstitions, hatred, and eminent danger. The crew must adapt to a feudal society without using modern tools or weapons. Fortunately the leader of a pack of telepathic wolves decides to help them. Visit Diane’s website (www.quicksilvernovels.com) to learn more about the characters in her new novels. Enter to win a book by Diane and 4 other authors! Thoroughly enjoyed this interview. Love a good ghost story, Diane, so will definitely be grabbing Murder on a Ghost Ship soon. 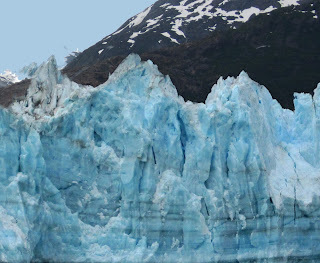 Recognize that picture of the glacier. I have one of it too - taken when my ex husband and I took the Inward Passage cruise in 1983. Alaska had such an huge effect on me I wrote a poem about it. I'm afraid of heights too, by the way. My knees wobble if I go near the edge of a cliff. Meant 2003. Where is my brain?